I’d planned to cook the prawn part of this dish on the barbecue but on the weather was so windy and horrible that I didn’t feel like standing out in it so I cooked the prawns on my grill pan on the stove. I really like Caesar salads but am often disappointed. In my opinion, it all depends on the dressing and really crisp and crunchy cos. I like the dressing to have a good garlicy punch but that’s up to you. Here there’s no need to be precise about quantities for anything except the dressing. Preheat the oven to 180°C. Heat a little olive oil in an oven proof pan and add the bread cubes. Toss to coat in oil and leave on the heat for a minute or two then put the pan in the oven. Bake the bread cubes till golden and crunchy. Use a stick blender to make the dressing. In a bowl or container, blend together the egg yolk, garlic, shallot, anchovies, lime juice and mustard. Gradually add the oil mix while continuing to blend. The dressing will thicken. Stir in the parmesan cheese. Placed the prawns in a bowl and mix with a little olive oil, juice of 1-2 limes and salt and pepper. Heat the barbecue or grill pan till hot. Add the prawns, cooking for about 1-2 minutes on each side depending on how big they are. 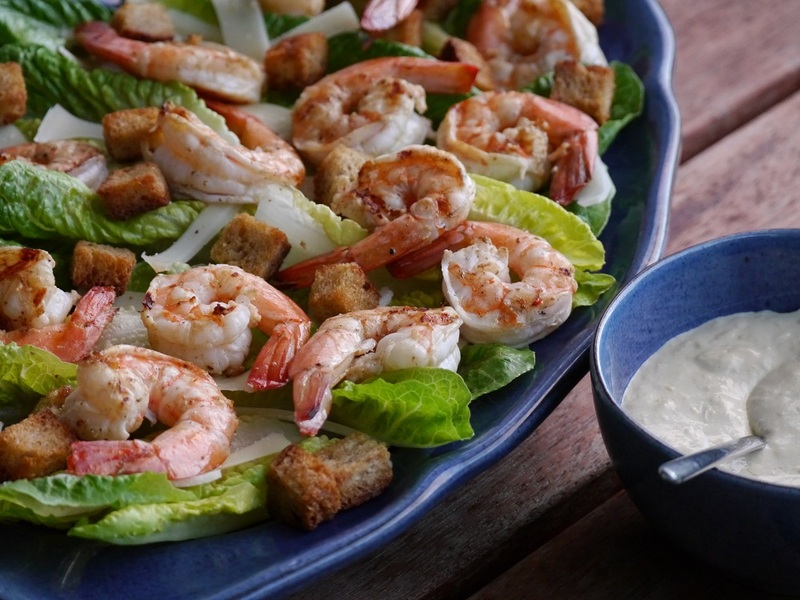 Put together the salad on a large platter or individual plates – cos leaves, then the shaved Parmesan and croutons and top with the grilled prawns. Serve the dressing separately and let everyone help themselves.